A swarm of feral (wild) honeybees landed in a tree near my house and established a hive right there on a tree branch out in the open. Normally they will search out a sheltered location such as a hollow tree, shed, wall of a house or other similar spot. Knowing they would not be able to survive our Michigan winter out in the open like that, I decided to place them into a beehive body. 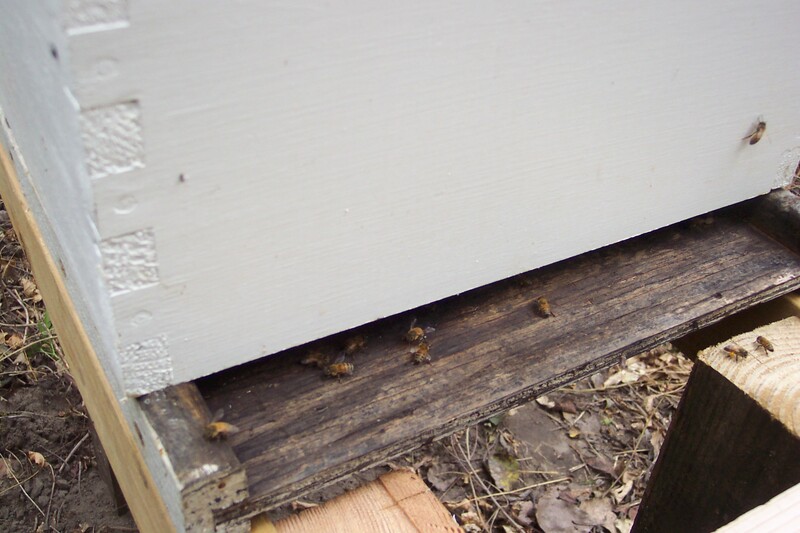 This is a wooden box of standard size used to keep bees. 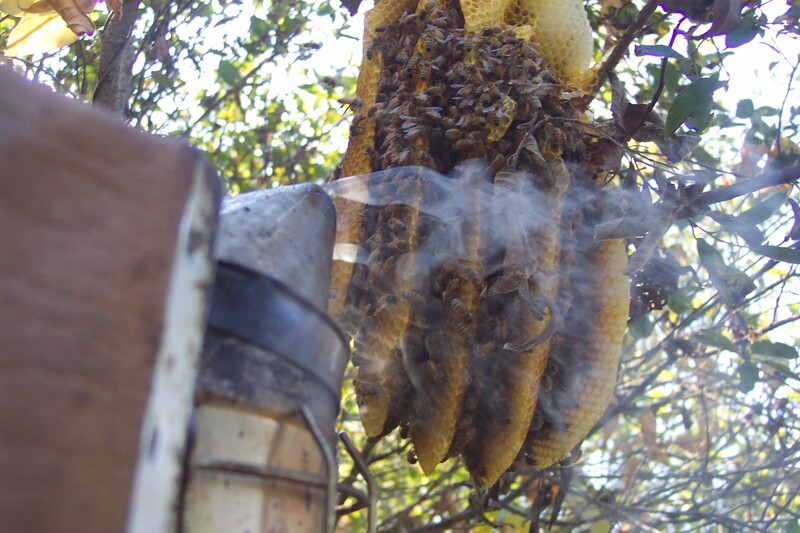 The first step is to smoke the bees to calm them down. 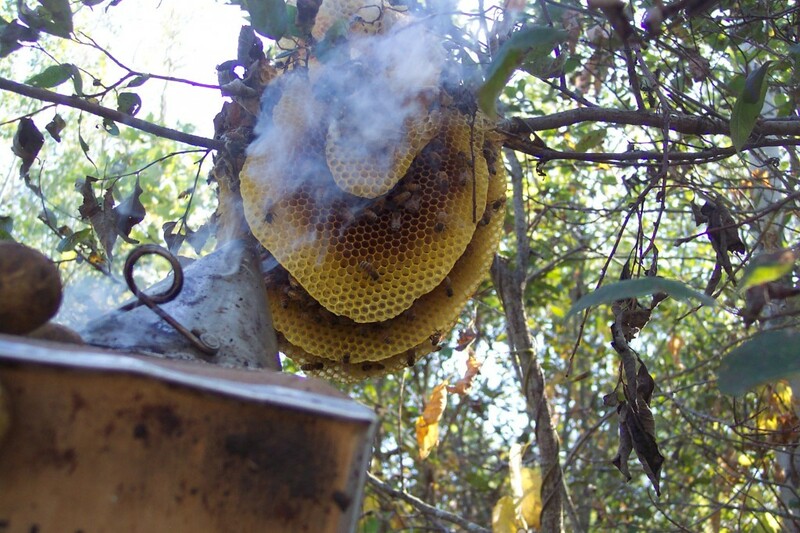 A bee smoker is the tool used for this purpose. 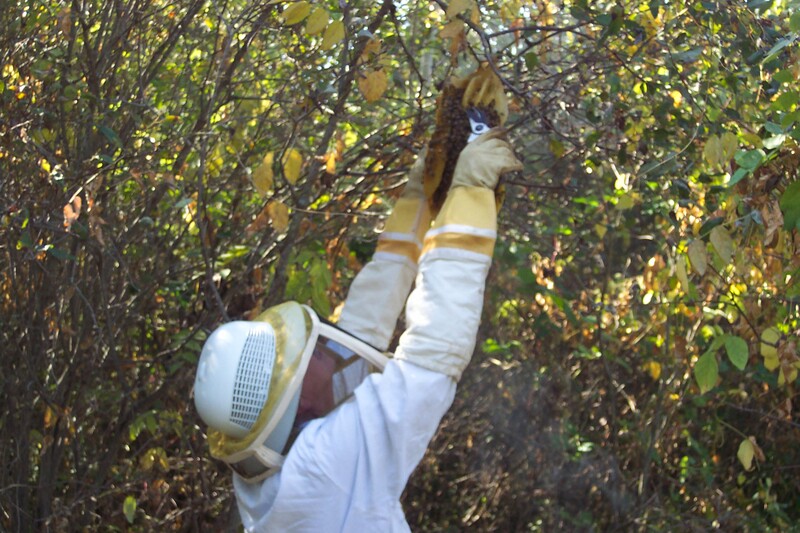 Once the bees have calmed down I was able to start cutting the nest away from the tree branches. Luckily I was able to reach the bees from the ground. 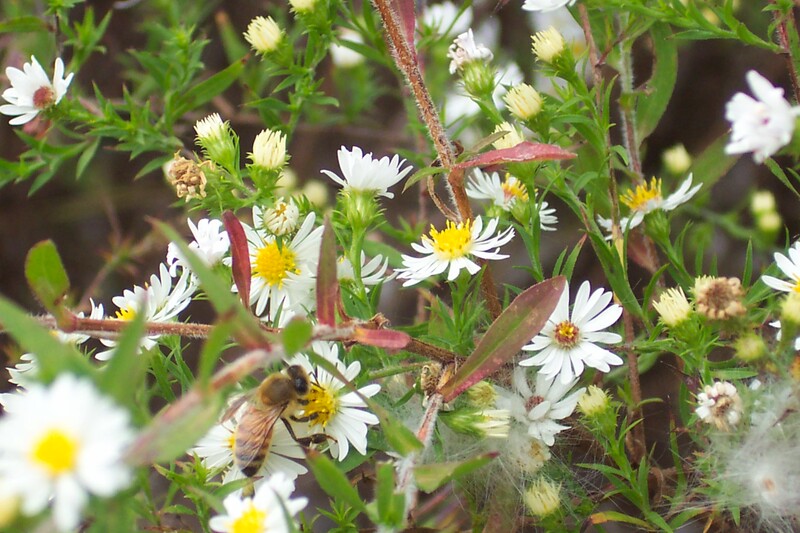 The bees didn’t seem to mind that I was carrying the from the spot they called home for most of the summer. Into the new home they go. 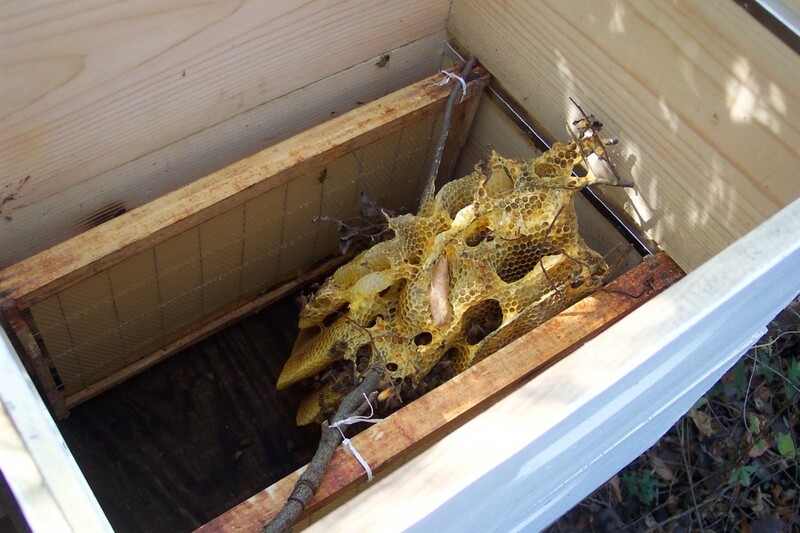 The bottom box, known as the hive body, is where the nest is placed. The upper box holds the temporary bee feeders. I wired the branch which was holding the combs on to a couple of wax frames. These are brand new and haven’t been drawn out into a honey comb. 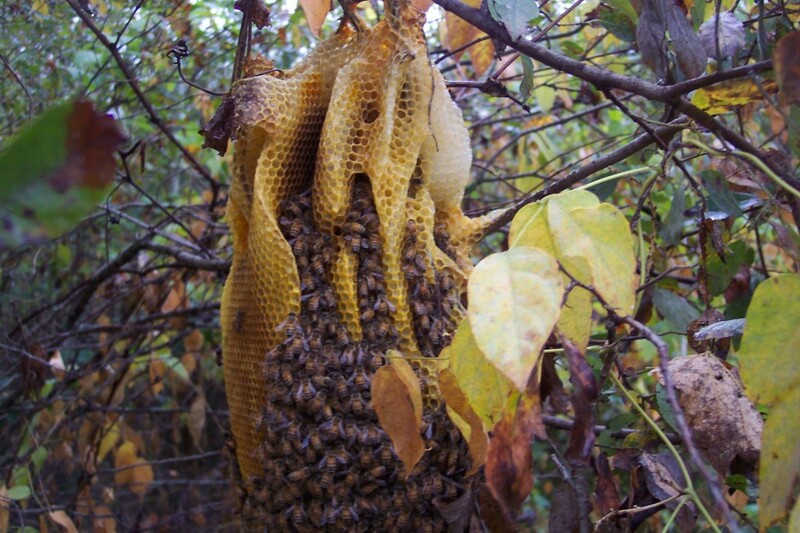 This is not very orderly compared to what you would find in a beekeepers hive body. Normally I would separate the combs and attach them to comb frames to make them easier to manipulate. 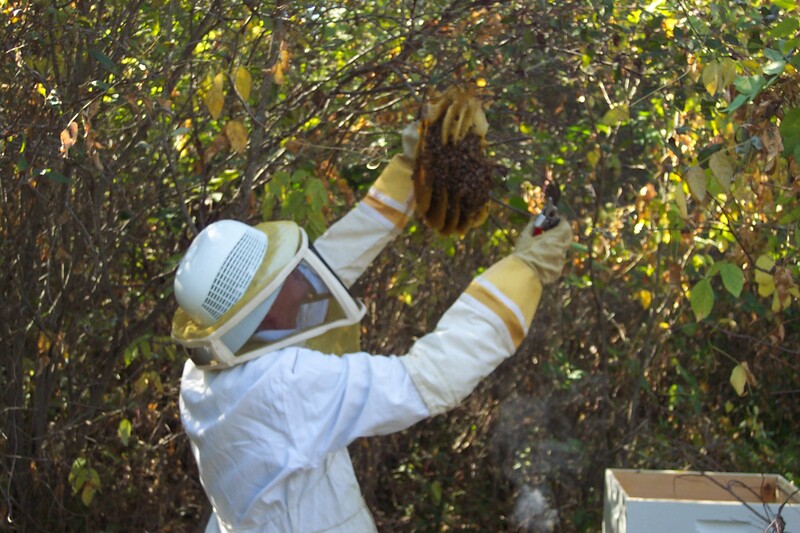 Feeding sugar syrup is critical if they are to have any chance at all to survive the winter. It rained a couple of days afterward. 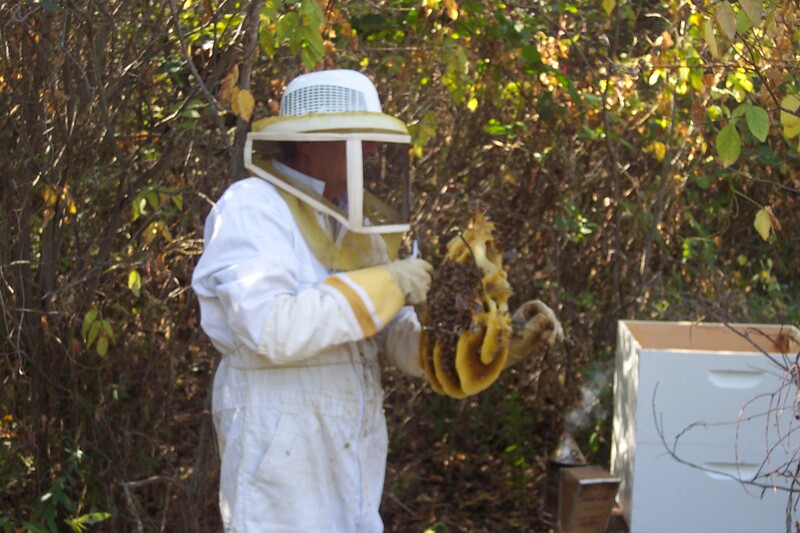 Bees can’t forage for nectar in the rain so the syrup was consumed by the bees during that time. 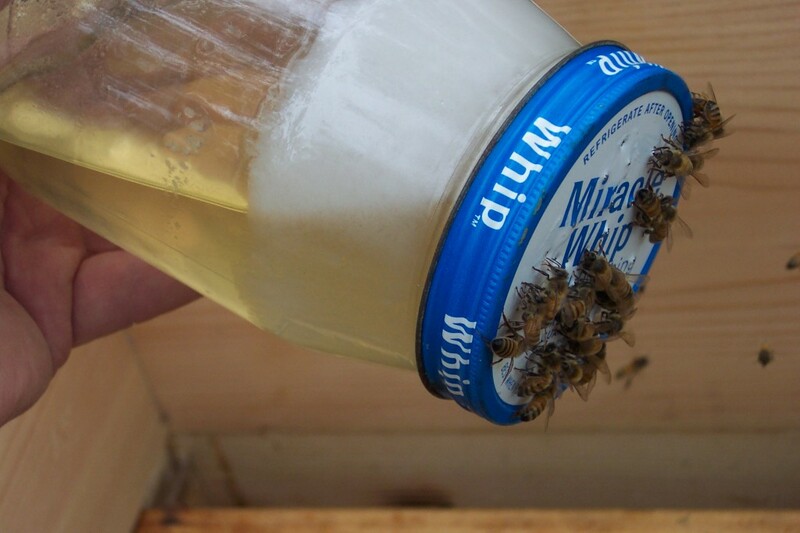 I used an old mayo jar with holes punched in the bottom as a feeder. Later I added another feeder to help them take up more syrup. This is one of my chicken waterers filled with syrup. 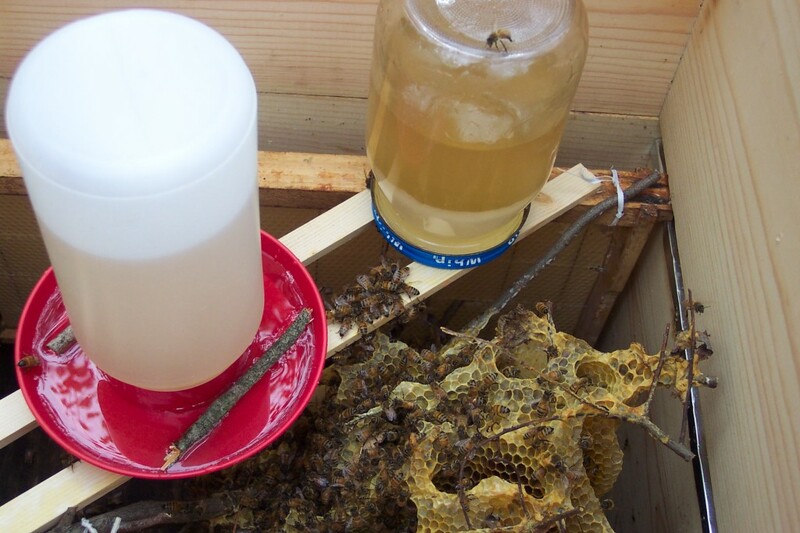 The sticks are there to help the bees climb up out of the liquid in case they accidentally fall in. We wouldn’t want them to drown. 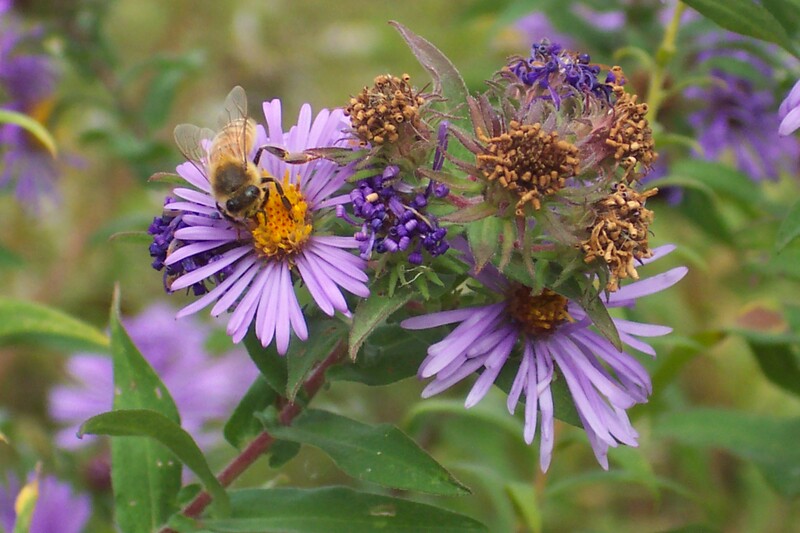 Bees can be seen flying into their new home with loads of nectar and pollen. 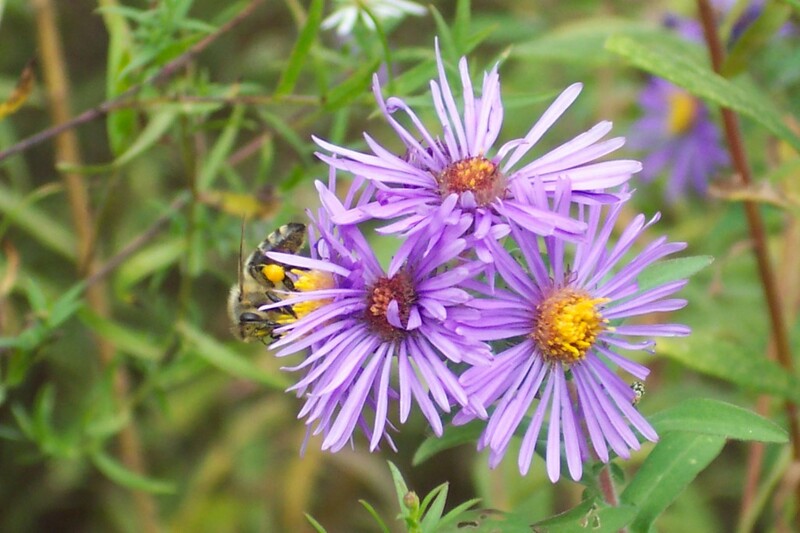 At this time of the year mostly Aster and Goldenrod nectar is collected by the bees. Hopefully we will have a mild winter this year. Often we will get a day or two of temperatures in the 50′s during the months of December through February. 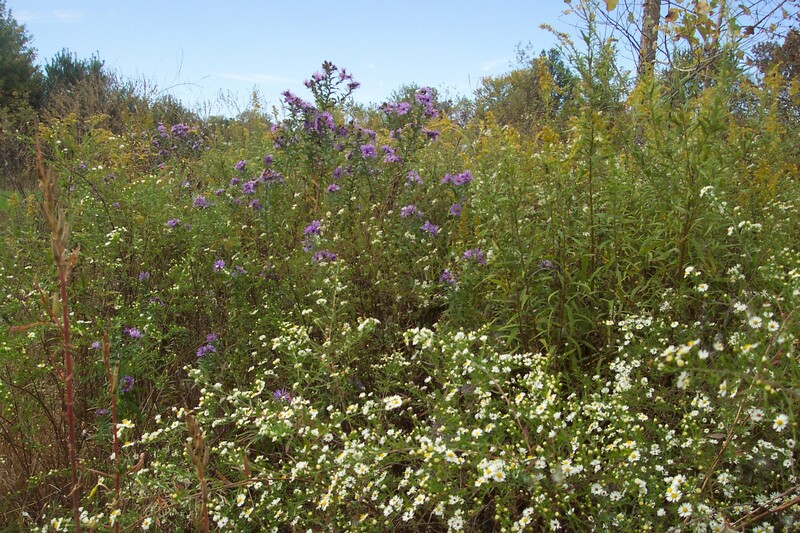 This will go a long way in helping the bees survive. If they make it to March, they will be facing another critical time. 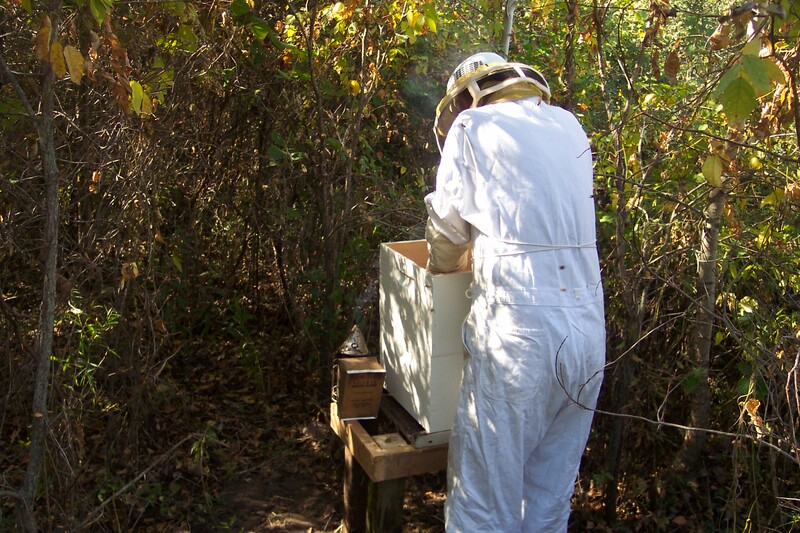 Many beehives are lost in early spring before the flowers begin blooming. They will need to be fed again until they can collect adequate nectar.